Another tough night for the team! At least 3 of us left with a sense that we could have done better! Away to Newlands 2 and never an easy one. They are a solid team from top to bottom. First up was David (Craig) at No.4 against David Fallis. This was a real ‘blast fest’ with both players pure meltin’ the baw! I was once again on mascot-minding duties (with Uncle Dougal) and didn’t see much of the match, but when I did watch it looked very even, with both players giving it a good old eckie thump! It’s great having a new mascot, although it’s also difficult to get them off the court in between matches. 23-year-old Egyptian Mohamed Elshorbagy has climbed to the top of the PSA World Tour rankings, overtaking 31-year-old Frenchman Gregory Gaultier. Strathgryffe came calling last night and as they finished in the champions league position’s in the past couple of years it looked like a tough match up for DLWE team who are at the Premiership establishing stage. First up was big David (Craig) and his daughter Elvi. 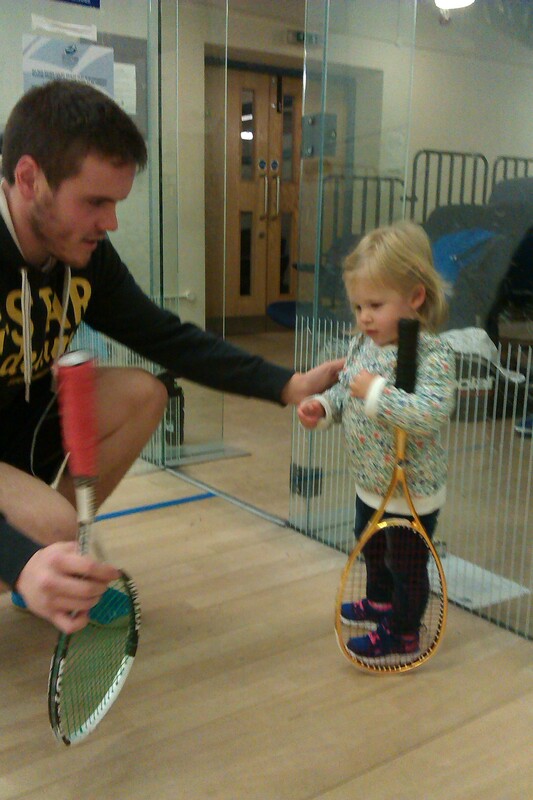 Both had rackets and although Elvi took to the courts first, it was eventually her dad who took on Ross (red) Lawrie at No.4. I was promoted to team child-care duties so Elvi and I sat and watched David and loudly clapped all his great shots – and booed Ross (whilst learning how to swing a racket!). Unfortunately due to David’s notorious slow match starts we were doing more booing than clapping (his warm up this week consisted of carrying Elvi’s Mickey Mouse backpack to the court). When David was one and a half games down we’d both seen enough Mickey Mouse squash and so it was book time and there’s none better for a 1 year old than ”Fox in Socks”! It’s so good it’s five star rated you know!?! Well what a difference that made and David won the 2nd game – I can’t tell you anything about the game, but what I can say is that Fox finds his second sock in a clock! Game 3 went to Ross and the 4th was a real close one with Strathgruffalo’s Ross winning it 15-13 to take the match. So with child-care duties taken care of Uncle Jase went off to watch Doug (Macmillan)….. So I turned up at 6.30pm (always advisable when you’ve only got 1 court) and was soon on against Mark Coyle at No.2. Mark can certainly crack the ball on those courts and had I played that sort of game against him then I’d have lost very quickly……so I didn’t. Instead I took the slower ariel route and this just frustrated the Giffnock Young Gun. The scores were all pretty close, but I mainly felt that I was more in control than not and managed to win all 3. No Sean again this week, to have a go at in the match report, not that this should stop me! And on a Forrest Gump theme I wish he was playing so I could use the “Stupid is as stupid does” quote!! Hope to see him back to full fitness soon.